Red Himalayan Flemingia is a perennial herb with tuberous root. Stems are prostrate, up to 2 ft, densely velvet-hairy. Flowers are borne in racemes in leaf-axils or at branch-ends, 2-10 cm, densely velvet-hairy; bracts lanceshaped, about 5 mm, striped. Flowers are bright red, clustered; flower-stalk about 1 mm. Calyx 5-lobed; lobes linear-lanceshaped, lower one longest, longer than tube. 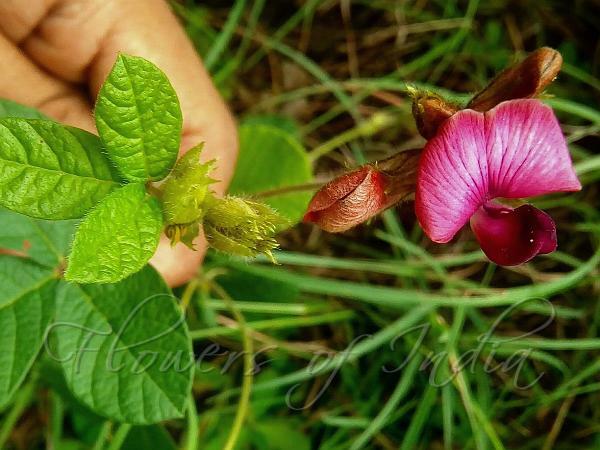 Flowers are slightly longer than calyx; standard elliptic, base with claw and ears at 2 sides; wings narrowly oblong, base with claw and ear at one side; keels sickle shaped, clawed. Leaves are digitately 3-foliolate; stipules ovate, 4-8 mm, persistent; leaf-stalk 1-2 cm, wingless, velvet-hairy; leaflet-stalks short, densely hairy; leaflets papery; end leaflet oblong or nearly obovate, 1-5 x 0.5-2.5 cm, both surfaces sparsely velvet-hairy or almost hairless, lower surface with dense dark red glands. Legume elliptic, about 5 × 4 mm, sparsely shortly hairy and black glandular. 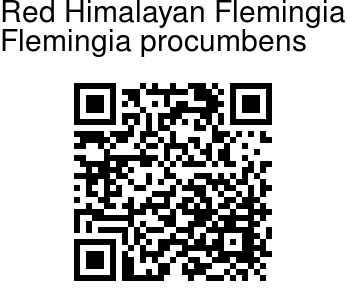 Red Himalayan Flemingia is found in the Himalayas, from Kumaun to Nepal, NE India, at altitudes of 2100-2900 m. Flowering: August-September. Medicinal uses: The juice of roots is used as an anthelmintic, for dysentery and stomachache. Outer skin of tubers is used as anthelmintic and fish poison. Identification credit: Ashutosh Sharma Photographed near Barot, Himachal Pradesh.